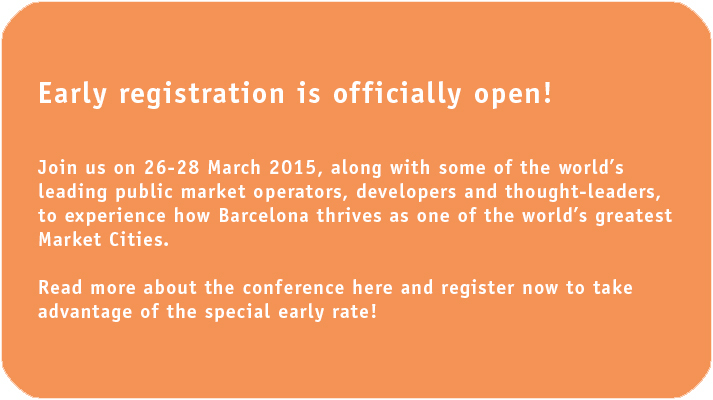 The 9th International Public Markets Conference will be held from 26-28 March in Barcelona, one of the world’s greatest Market Cities. This three-day event hosted by Project for Public Spaces (PPS) and the Institut Municipal de Mercats de Barcelona (IMMB) – operator of the city’s remarkable market system – in partnership with UN-Habitat and United Cities and Local Governments (UCLG), will gather together the world’s leading public market operators, developers and thought-leaders. The Conference will explore new trends and innovations for the preservation and revitalization of public markets internationally, with participants also experiencing how Barcelona triumphs as a Market City. Together, these actors will articulate a new global vision for public markets as authentic spaces that are increasingly recognized for their contributions to sustainable food systems, local economic development and rural-urban linkages. In most cities across the world, markets hold significant potential for economic development. Public markets and the relationship with vendors, both formal and “spontaneous” or “informal”, are crucial topics for local and regional leaders and authorities since they relate to urban development, particularly the redevelopment strategies of city centers. The concept of “Market Cities” can once again become a driving force for policy in cities. By linking food with place, 21st century urban market systems can become vital centers of exchange, connecting rural and urban environments as well as places that anchor local culture and social life for all residents. Market Cities provide multiple economic, social, health and environmental benefits that are essential to creating healthy, vibrant, and extraordinary places for people to live, work and play. The UCLG Working Group on Local Economic Development and its members and partners also highlight the importance of markets for the creation of jobs and entrepreneurship, in particular for women and SMEs. For the UCLG Working Group on Intermediary Cities, markets are an essential service and a key feature of intermediary cities, as they provide a linking point to the rural economy. Mohamed Sefiani, Mayor of Chefchaouen, Morocco, and President of this UCLG Working Group, has identified a number of enabling measures associated with markets, such as local markets promoting products from the region and hinterland (KM-0), and services linked to cleanliness, public space management, traditional food and other basic services. The conference should serve as springboard for further dialogue and policy action internationally, and should identify specific opportunities to scale up this concept and to develop strategies for implementation. Delegations of city policymakers, community organizations and market operators are strongly encouraged to attend. The Barcelona conference in March 2015 comes at an important time, amidst growing momentum around the UN’s new Sustainable Development Goals (SDGs) for sustainable cities and human settlements, as well as the debate on the rural-urban nexus and city-region food systems. This invitation-only side event, which will be held on Wednesday 25 March 2015, will identify key issues and develop a conference declaration on public market systems as a critical component of the rural-urban nexus.